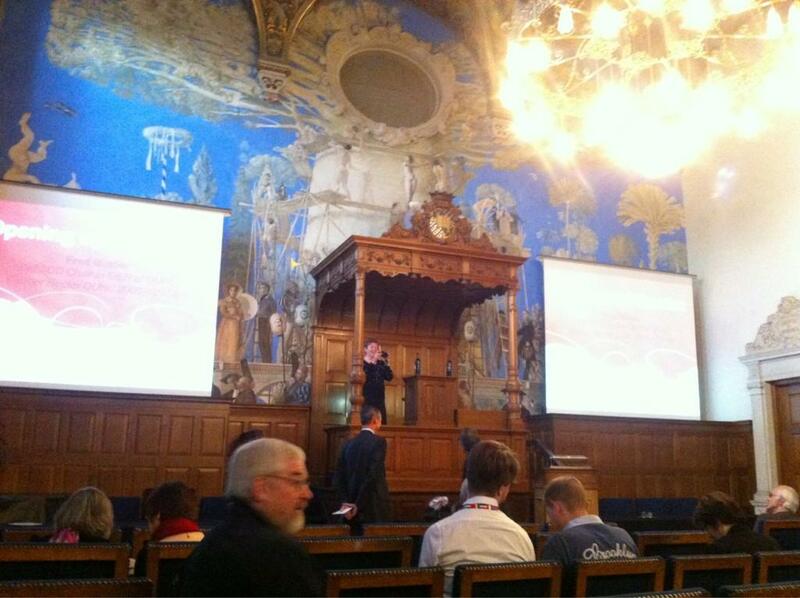 Back in October 2012 I attended the 11th European Conference on E-Learning (ECEL) held in Groningen, the Netherlands. This was the first time I’d attended this conference. I presented a poster on our work with the Department of Psychology on their induction programme for the BSc course in September. The conference was interesting, mostly because it gave some insight into how City’s educational technology perspective is much more teaching-and-learning focused than many other universities’. Many of the presentations I attended were very technology-orientated and I heard people commenting that they would have preferred them to be more so! I attended some useful sessions: methods for sending students notifications on Moodle updates via Facebook and Twitter; the changing role of the academic in the Web 2.0 world; and an interesting case study on use of blogging for portfolio development. My poster summarised the word I had done with the BSc Psychology Director of Undergraduate Studies Marie Poirier, to redesign elements of the induction programme for undergraduate Psychology students. There was agreement between the department and our team that induction would be improved by being more learner-centred, less “information overload”, and by giving students more opportunities to get to know staff and each other. Accordingly, we redesigned many of the activities the students take part in during the week. My involvement was mainly in the first day “orientation activities” and in the Moodle induction on the fourth and final day. The students’ first task on their first day at university in September was to get into their tutorial groups and meet the other students who had been allocated the same personal tutor as them. After a welcome and a brief introductory talk from Marie they were divided into small groups of four or five. Each group was loaned an iPad which they used to go off and make short videos about each other and about their personal tutor. Many of the students were quite excited and impressed to be given these devices to work with on their first day – however, the main reason we used the iPads was because they allow quick and easy shooting, editing and uploading of video (via iMovie and pre-created private Vimeo accounts), and because students can also use them to research their personal tutor. We had run a similar activity the previous year with Flip cameras and laptops: the iPads made the whole process quicker and easier. The approach we took with the Moodle induction was to redesign it as a task-based fact-finding activity requiring students to work in the same groups as they had been in on the first day. The groups were given access to a tailor-made induction module which contained activities such as quizzes, choices, questionnaires and practice assignment submission points. (They could also watch the videos they had shot on Monday). The idea behind this approach was to have students simultaneously learn about and use Moodle: to learn how to use its tools and functionality by finding out something about it. We also wanted to address many of the concerns and questions students have about their new course by giving them the chance to find out the answers to some common questions (How do I find out my timetable? How do I submit my assignments? How do I connect to the wifi?). Finally, we wanted the induction activity to be clearly and explicitly tailored for Psychology students: we included links to commonly used Psychology resources and included contact details for key members of staff in the department. Without too much work, similar approaches could be taken for other departments in the School. For details of how the project was evaluated, click on the link below to view a copy of the poster. If, as a member of staff in the School of Arts and Social Sciences, you’d like to try something similar for your induction, please get in touch.